Enhance the look of a traditional room and provide soft lighting with this lovely Tiffany-style glass swing arm wall lamp. Add a warm and lively lighting element to your decorating scheme with this iron vine wall lamp. 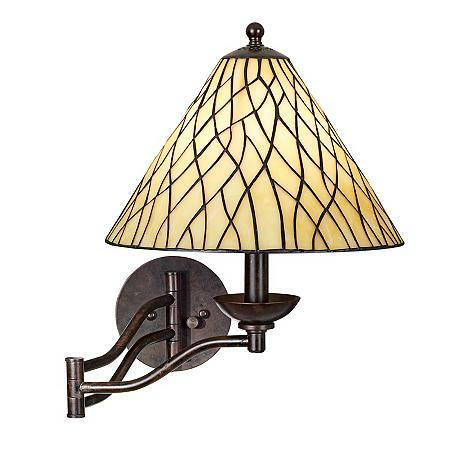 This swing arm lamp features Tiffany-style art glass and an organic, flowing iron vine shade. It also features a full range dimmer and 23" extension for adjustability. Enjoy the ideal lighting level thanks to the included full-range dimmer. Plugs into any wall outlet. • Takes one 100 watt (not included). • Extends up to 23" from wall. • Shade is 3" across top, 12" across bottom, and 9 1/2" on slant. • Backplate is 5 1/2" wide.